Interest in formal methods continues to grow; unfortunately myths and misconceptions regarding their benefits and application continue to grow also. Applications of Formal Methods is a collection of articles by internationally renowned contributors from both academia and industry which will dispel many of these myths. Each of these essays illustrates the application of formal methods to realistic problems, each with an industrial relevance, in various application domains, describing how they can be scaled to large-scale problems, and providing an evaluation of methods, tools, and validation and verification techniques. Emphasizes tool support and the use of validation and verification techniques. 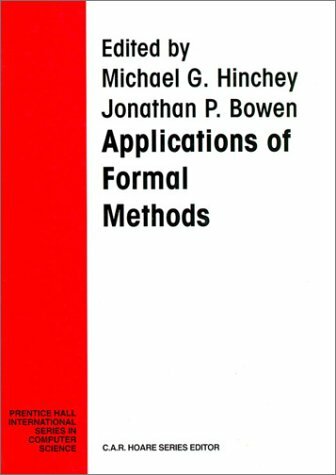 Applications of Formal Methods is essential reading for all students of formal methods and system development, as well as project managers considering the introduction of formal methods, and researchers in the field wishing to know more about industrial application and wishing to learn from the experiences of others. The contribution of this book is exceptionally welcome, since it reports on a range of independent experiments in the application of theories on an industrial scale. In spite of diversity in the areas of application and in the formalisms selected, there is an encouraging uniformity in the overall conclusion: if appropriate attention is also paid to commercial, managerial and educational implications, there is a positive benefit to be achieved by increasing the level of formalism at the earliest possible stages of specification and design; and this benefit can be felt, if not measured, on the occasion of first use. There are grounds for optimism that second use may be even more beneficial. That is why I regard the publication of this book as a milestone in the development of the series. It is a confirmation of the soundness of the goals that we have pursued in the past, and a promise of further achievement in the future. Foreword by Prof. C.A.R. Hoare, Oxford University, UK. Applications of Formal Methods FAQ, pp 1–15. Using Mathematical Models in the Inspection of Critical Software, pp 17–31. Glenn Bruns & Stuart Anderson, University of Edinburgh, UK. Gaining Assurance with Formal Methods, pp 33–54. Formal Specification of an Architecture for a Family of Instrumentation Systems, pp 55–72. Formal Specification of the STV Algorithm, pp 73–96. Application of the B-Method to CICS, pp 97–124. Formal Verification of the AAMP5 Microprocessor, pp 125–180. Modeling and Verification of a Simple Real-Time Gate Controller, pp 181–202. CombiCom: Tracking and Tracing Rail Traffic using VDM++, pp 203–226. Formal Development of Safety-Critical Software Systems in Railway Signaling, pp 227–252. Z Applied to the A330/340 CIDS Cabin Communication System, pp 253–284. Specifying the Kernel of a Secure Distributed Operating System, pp 285–306. Formal Specification of an Aerospace System: The Attitude Monitor, pp 307–332. Developing a Security-Critical System using Formal and Conventional Methods, pp 333–356. This chapter reports on the work of the ConForm project. The use of Z within a Safety-Critical Software System , pp 357–374. Multiparadigm Specification of an AT&T Switching System, pp 375–398. Formal Methods Technology Transfer: Impediments and Innovation, pp 399–419. See also purchase information from Prentice Hall, including international orders. Letter from the Series Editor, 1996. The main goal of the series has been to develop, illustrate and promulgate the scientific basis of computer programming, and its application in software engineering on an industrial scale. It is very encouraging to publish a record of success in this endeavour. Jonathan Bowen and Michael Hinchey have put together a varied collection of industrial case studies under the title Applications of Formal Methods. I hope they will be welcomed by the practitioner, removing some of the fear (but none of the challenge or benefit) of keeping to the forefront of the state of the art. Computer Weekly, 1 February 1996. Heartily recommended and hopefully to be followed by more of the same. — Peter Fox, Senior Consultant, EDS Ltd.
Times Higher Education Supplement, 13 September 1996. This is a well edited collection of case studies that will give readers useful insights into practical applications of a range of notations (including VDM, CCS and B-method). A collection like this is an important milestone for the formal methods community. — Prof. Norman Fenton, Centre for Software Reliability, City University. Ten Commandments of Formal Methods. Technical Report No. 350, University of Cambridge Computer Laboratory, 18pp, September 1994. Seven More Myths of Formal Methods</A>. <A HREF= Oxford University Computing Laboratory] Technical Report PRG-TR-7-94, 19pp, June 1994. Seven More Myths of Formal Methods: Dispelling Industrial Prejudices. In M. Naftalin, T. Denvir and M. Bertran (eds), FME'94: Industrial Benefit of Formal Methods, Springer-Verlag, LNCS 873, pp 105-117, 1994. Seven More Myths of Formal Methods. Technical Report No. 357, University of Cambridge Computer Laboratory, 12pp, December 1994. The Use of Industrial-Strength Formal Methods, J. P. Bowen and M. G. Hinchey. Proc. 21st International Computer Software & Application Conference (COMPSAC'97), Washington D.C., USA, 13-15 August 1997, pages 332-337, IEEE Computer Society Press, 1997. Industrial-Strength Formal Methods in Practice, J. P. Bowen and M. G. Hinchey (eds.). Springer-Verlag, FACIT series, 1999. High-Integrity System Specification and Design, J. P. Bowen and M. G. Hinchey. Springer-Verlag, FACIT series, 1999. See also information on formal methods. Many contributors are members of the ESPRIT ProCoS-WG Working Group.